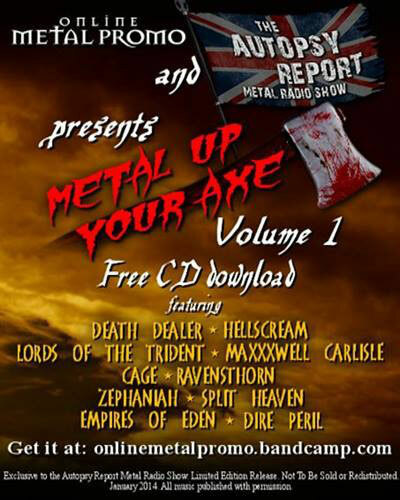 Online Metal Promo teams up with THE AUTOPSY REPORT radio show (UK) for another FREE digital download compilation CD "Metal Up Your Axe" featuring their roster bands and some newly added fellow metal rising stars, including 3 bands we have festured on this site. It contains 10 songs and the cover artwork. It's now available for FREE DOWNLOAD on Online Metal Promo band camp page. Metal fans, don't miss this great opportunity! Go to DOWNLOAD page.